This breakout book by Alison Bechdel is a darkly funny family tale, pitch-perfectly illustrated with Bechdel's sweetly gothic drawings. Like Marjane Satrapi's Persepolis, it's a story exhilaratingly suited to graphic memoir form. Meet Alison's father, a historic preservation expert and obsessive restorer of the family's Victorian home, a third-generation funeral home director, a high school English teacher, an icily distant parent, and a closeted homosexual who, as it turns out, is involved with his male students and a family babysitter. Through narrative that is alternately heartbreaking and fiercely funny, we are drawn into a daughter's complex yearning for her father. 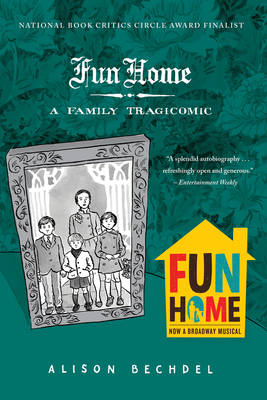 And yet, apart from assigned stints dusting caskets at the family-owned "fun home," as Alison and her brothers call it, the relationship achieves its most intimate expression through the shared code of books. When Alison comes out as homosexual herself in late adolescense, the denouement is swift, graphic -- and redemptive.